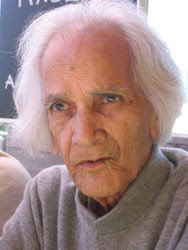 U.G Krishnamurti - The "Non-Guru" passed away in Italy. Nimmi and I had great fun watching/listening to U.G. For us, he was a great "controversial" non-Guru who like Osho and J.Krishnamurti, dared to disect the basic building blocks of Human Consciousness ... Bye U.G!!.. Sending you Love !!! "If you have the courage to touch life for the first time, you will never know what hit you. Everything man has thought, felt and experienced is gone, and nothing is put in its place." "Whether you are interested in Moksha, Liberation, Freedom, Transformation, you name it, you are interested in happiness without one moment of unhappiness, pleasure without pain, it is the same thing." "We don't want to be free from fear. All that we want to do is to play games with it and talk about freeing ourselves from fear." "When the movement in the direction of becoming something other than what you are isn't there any more, you are not in conflict with yourself." --U.G.